I met Todd Shalom four or five years ago at Walter De Maria’s Lightning Fields in New Mexico. We wandered around the desert together watching jackrabbits, strange insects, and the light change while talking about love and relationships. Year later we both started walking projects (oddly enough, another artist who was there with us, Aaron Ximm also created a walking project). Todd will be joining The Long Walk and sharing with us a series of participatory, poetic exercises. 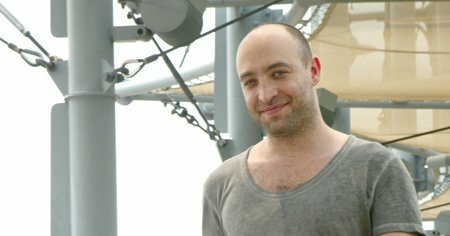 GRINDR HAS HELPED REVOLUTIONIZE THE WAY most gay New Yorkers interact, but gay artist Todd Shalom, founder of Elastic City (Elastic-City.com), which organizes conceptual New York walks, thinks it might also be able to transform an unlikely entity: walking tours. “We want to queer the technology of Grindr with the intention of increasing the likelihood of more meaningful connections,” the 34-year-old says about the Gay Pride-oriented Findr walk he is hosting June 24–26 with artist Jacob Gaboury. Since May 2010, Shalom, who got the idea of leading walks after he realized he wanted to “cultivate poetry in [his] everyday life,” has organized artist-led walks that explore the more experiential than fact-based elements of our city. “For instance, we might make monuments with our bodies in response to the monuments in public space as opposed to learning the height of the Statue of Liberty,” the Prospect Lefferts Gardens resident says. The Findr walk will actually be a self-guided tour that instructs participants to download the Elastic City logo and make it their profile picture on Grindr. “From there, it remains to be seen what people do and how they will navigate the city,” says Shalom. The Findr walk isn’t the first queer trek that Elastic City has led (last Pride saw a Dirty Gay Soundwalk through the West Village) and Shalom says the organization has a sizable gay following. “We’re forming a wonderful community, slowly but surely,” he boasts. “I can only think of one negative reaction to a walk. It was from a woman who thought she was getting a walking tour of Ground Zero, only to realize it was a Gestalt-based walk where participants embody the landscape of the construction site.” We’re guessing she doesn’t know what Grindr is, either.